Outdoor Hour Challenge Summer #7 – Summer Cattail Observations. – Bold – are words from the Handbook of Nature Study website. – Italics – are words from the book titled Handbook of Nature Study by Anna Botsford Comstock. – Regular – are my own words. Read pages 500-502 in the Handbook of Nature Study if you have not done so before (starting on page 551 if you have the free download version) . It might also be beneficial to read it again this season and highlight the parts that contain information about the leaves of the cattail plant. In June and early July…it will be seen to have the upper half of the cat’s tail much narrower and different than the lower half – as if it were covered with a quite different fur. (this is where the pollen comes from). It seems to be clothed with a fine drooping fringe of olive yellow. The fringe is a mass of crowded anthers, two or three of them being attached to the same stalk by a short filament. These anthers are packed full of pollen. All the leaves have the same general shape, but vary in length. Olivia and Sophia by a group of cattails. is ready to do something different. Each leaf consists of two parts: the free portion, which is long and narrow and flat towards its tapering tip but is bent into a trough as it nears the plant; and the lower portion, which clasps the plant entirely or partially, depending upon whether it is an outer or inner leaf. The texture of the leaf is soft and smooth. The cattail is adopted for living in swamps where the soil is wet but not under water all the time. The cattail roots are fine and fibrous. Enjoy your outdoor time this week at your cattail spot. If you have been participating in the year-long cattail study since last autumn, you will know just where to look for cattails. Use the suggestions from the Handbook of Nature Study to talk a little about the habitat where your cattails are growing. Is your cattail still growing in water or has it dried up? The cattails are both growing in and out of the pond. The cattails grow in and out of the pond. What does the “cattail” parts of the plant look like now? “There’s some kind of stem at the top,” Olivia said. I asked the girls to remove one of the cattails so that they could observe it closer inside. Olivia tried to snap off the cattail, but the stem was very tough to remove. Sophia tried, struggled a bit, and finally was able to break it off. so they could examine it indoors. What color and shape are the leaves? Do you see the cattails seeds or balloons? Can you pull some of the fuzz from the cattail and observe it more closely? We took one cattail as well as a small section that was on another stalk. We brought these two items inside to look at them closer with a magnifying glass. Some of the plant is included in the nature journal page. How do you think the seeds spread, by wind or water? The girls both thought they would be spread by the wind. However, as we discussed it more, we thought the seeds could be spread by both wind and water – the wind could carry the seeds to different nearby areas of the pond and pasture; and the water could carry the seeds (once they landed on the water) to different parts of the pond itself. How crowded are the cattails growing together? Some of the cattails grow close together in the pond while other cattails are growing by themselves in different parts of the pond. and pasture. The pond where the cattails are growing. Sight: Observe the cattail’s habitat. 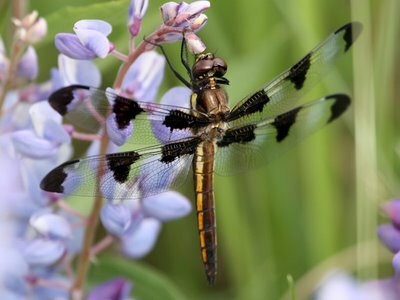 Look for birds, insects, and animals living or resting in or on the cattails. Look for nests. See if you can find the cattail flowers. The girls saw red-winged blackbirds, two unidentified birds, many dragonflies, and mosquitos. The dragonflies were twelve-spotted skimmers. We were seeing the brown and white winged ones – the males. We didn’t see any females. Smell: Sit or squat near your cattails and close your eyes. Breathe deeply and see if you smell anything. We didn’t sit near the cattails because most of them were near or in the pond. There seemed to be a lot of mosquitos and other insects near the edge of the pond. Olivia was having a particularly difficult time with all the bugs, so I opted to move on to walking in the wooded area of the pasture and see if we could spot anything else of interest. Touch: Feel the leaves, edges, and spikes of the cattails. Both of the girls felt the leaves and thought they were soft and silky. Despite the softness, they are quite tough and provide a bit of challenge when trying to break a small section off. Hearing: Take a minute to listen as you stand or sit near your cattails. Can you hear any birds or insects? Water running? The red-winged blackbirds were the predominant sound…that and the buzzing of mosquitos. The water is in a pond, so there isn’t much movement on a relatively calm day. Make sure to allow some time after your outdoor hour to discuss any subjects that your child finds interesting. Encourage the completion of a nature journal entry recording your observation of your cattails. You may wish to pull out your other cattail entries and compare the year-long changes in your cattails. Once we were inside, we spent time touching and looking at the cattail balloon and leaves. From a sensory aspect, the cattail has such a diversity of textures which makes it an interesting plant to explore. Since we finished our cattail year-long study, we notice cattails as we travel around our area more. Once you start to study a subject it is as if you are hyper-sensitive to from then on. Your girls did a great job on their study, especially using their senses near the pond. Thank you so much for sharing your link with the OHC.